One or more species of Freycinetia, (Pandanaceae), the roots of which were used for making specialized fish traps. PROTO POLYNESIAN *Kie, Pandanus odoratissimus, (Pandanaceae), and a mat made from leaves of this plant. 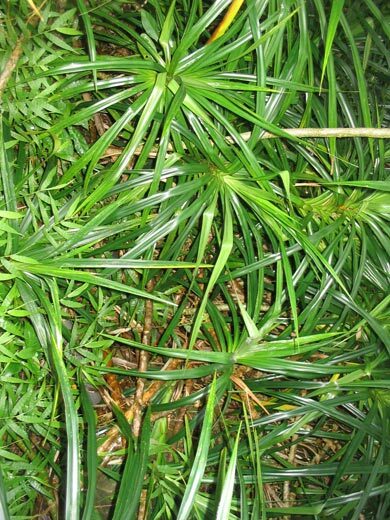 Samoan: 'ie'ie (three species of Freycinetia, Pandanaceae, also known as salasala, siganopa, & tuāfaga; in Tutuila, American Samoa, tuāfaga refers to the adventitious roots of the 'ie'ie). This name ('ie'ie in Samoa, Tahiti and Hawaii, and Kiekie in the Marquesas, Rarotonga and Aotearoa) seems to have originated in Samoa, an analogical reference to the variety of pandanus, 'ie, or lau'ie, used for making fine mats. 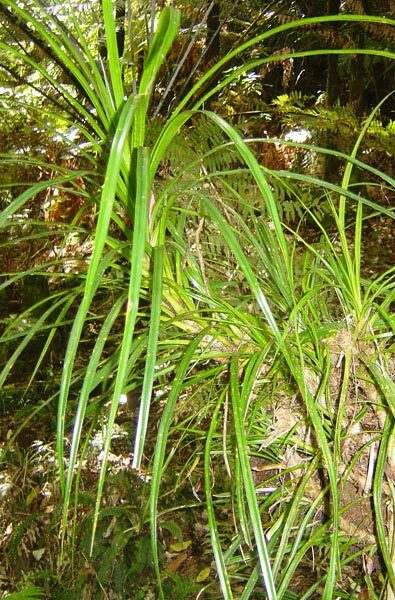 In Samoa it is applied to the three native species of Freycinetia (also members of the wider Pandanus plant family), F. storckii, widely distributed at higher altitudes, and also found in Fiji, F. hombronii, found mostly along higher ridges and craters, the roots of which were used in making fish traps, and F. marginata -- both the latter species are widely distributed in the Western Pacific. According to Art Whistler (Plants in Samoan Culture, p. 169) the circular woven fish traps, 'enu, woven from 'ie'ie roots are now rarely made. Roots of species of Freycinetia were also used for making fish traps in other parts of Polynesia, including Aotearoa, the Cook Islands and the Marquesas. In Tahiti the adventitious roots are also used in basket work. 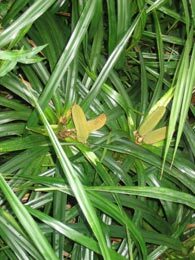 All the species of Freycinetia with names derived from *kiekie are climbing plants with similar habits and general appearance. Freycinetia arborea - 'ie'ie - climbing a Eucalyptus tree. Further information : There is more information about these species and their uses in Art Whistler's Plants in Samoan Culture, and the other publications on Samoan, Hawaiian and other regional and local floras and general works on plants in tropical Polynesia and Aotearoa included in the Bibliography. 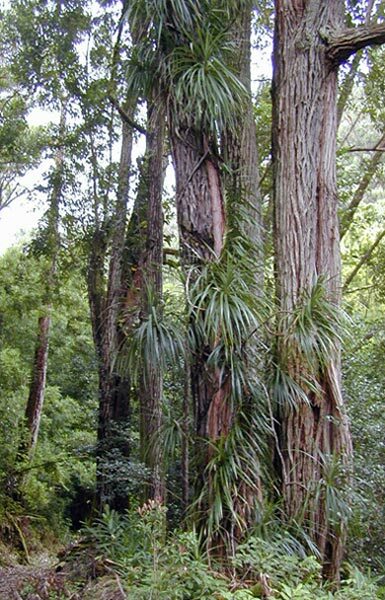 There are pages on Freycinetia arborea and Pandanus whitmeeanus in the Bishop Museum's Cook Island database (see also Wagner et al. pp. 1478-9, and the article on East Polynesian Freycinetia by Benjamin Stone). Photographs: The picture of the 'ie'ie climbing a Eucalyptus tree is by Forest & Kim Starr, and that of the NZ kiekie is by Wayne Bennett. The others are by RB: they were taken on the side of a gully in the Lyon Arboretum in Upper Mānoa, Honolulu. My good friend Prof Will McClutchie accompanied me on this particular expedition, and thoughtfully held my cell phone while I was taking these photographs, so he could give his condolences to my next of kin should I lose my footing and plunge to my doom into the canyon below.